And so begins the first studio album of a certain Elvis Aaron Presley. Gospel choirs, white jumpsuits, and Las Vegas way off in the future, this recording shows Elvis at his raw, energetic best; a young man with a passion for the music he is singing. Clocking in at just over 25 minutes, the eleven tracks sail by, and in most circumstances this would leave the listener feeling slightly underwhelmed. On Elvis Presley, however, brevity works to its advantage, and by the time it finishes, it seems that Elvis has slapped us around the face, said ‘Hi y’all’, and sauntered off into the distance leaving us hungry for more. The fast-paced rock ‘n’ roll tracks may have made Elvis his name, but it’s on the slower songs that his talent really shines here. 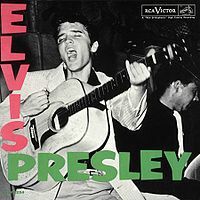 The exquisite Blue Moon, with its muted guitar arpeggios and minimalistic double-bass, provides Elvis with a blank canvas, on which he gives us the album’s highlight: his trademark low croon alternated with an incredibly heartfelt falsetto. Listening to this 54 years after its release, it’s hard to imagine the impact it had when it first came out; and as a result, I can’t help but feel I’m not getting the full experience. Even if Elvis Presley isn’t the inspirational masterpiece it once was, it remains a fine album, packed with toe-tapping rhythms and sublime vocals.